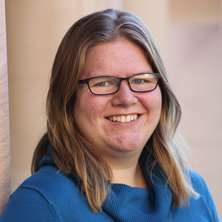 Dr Janie Hoormann works as part of the Australian Dark Energy Survey (OzDES) where she regularly observes 771 distant galaxies in order to measure the mass of the supermassive black hole found in their centres. Using this information Janie studies how these black holes and the galaxies housing them have evolved over the past 12 billion years. Janie received her PhD from Washington University in St. Louis in 2016 where she did simulations of how X-rays behave around black holes as a way to test Einstein’s theory of general relativity. Hoormann, J. K. , Asorey, J., Carollo, D. , Moller, A. , Sharp, R. , Sommer, N.E. , Tucker, B.E. , Zhang, B. , Lidman, C. , Brout, D. J. , D'Andrea, C. , Gladney, L. , March, M. , Sako, M. , Wolf, R.C. , Brown, P. J. , Krisciunas, K. , Suntzeff, N. , Macaulay, E. , Nichol, R. , Childress, M. , Prajs, S. , Smith, M. , Sullivan, M. , Maartens, R. , Kovacs, E. , Kuhlmann, S. , Spinka, H. , Ahn, E. , Finley, D. A. , Frieman, J. , Marriner, J. , Wester, W. , Aldering, G. , Gupta, R. , Kim, A.G. , Thomas, R. C. , Barbary, K. , Bloom, J. S. , Goldstein, D. , Nugent, P. , Perlmutter, S. , Foley, R. J. , Pan, Y.-C. , Casas, R. , Castander, F. J. , Papadopoulos, A. , Morganson, E. , Desai, S. , Paech, K. , Smith, R. C. , Schubnell, M. , Yuan, F. , Davis, T. M. , Hinton, S. , Muthukrishna, D. , Parkinson, D. , Lewis, G.F. , Uddin, S. , Kessler, R. , Lasker, J. and Scolnic, D. (2016) Classification of 17 DES Supernova with OzDES. The Astronomer's Telegram, 9855: .